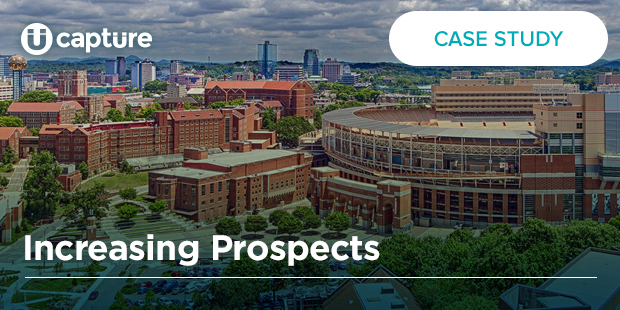 While the university has a strong application flow, the goal of this particular campaign was to increase the number of UT prospects. Served a Progressive Identification form — a short form (pop up or embedded) — to collect basic information such as name, email, phone number, etc. in order to identify a visitor. Completed forms can also trigger other pieces of dynamic content, and our team of experts advised on how to identify visitors that are on the site but haven’t raised their hand yet. Of the 13,357 Progressive Identification forms that were submitted, 10,792 — that’s 81 percent of them — were from website visitors who were not a part of the university’s pool. These were organic leads on UT’s site who were not purchased names, or anyone with whom the school already was communicating. The University of Tennessee, Knoxville is a large, public state institution located in Knoxville, Tenn., serving more than 28,000 undergraduate, graduate and non-traditional students.